Fifty years ago Helvetica was released under the name Neue Haas Grotesk. It seemed to have come at the right time in the right place, and after it was renamed Helvetica in 1960 it quickly became even more ubiquitous, with a popularity it retains to this day. The typeface is even the subject of a new film, Helvetica (dir. Gary Hustwitt, 2007). But is Helvetica really so good that it justifies its worldwide use on such a large scale? Long before the first serif-less types for printing appeared, house painters and cartographers were painting and engraving sans serif numbers and letters. It was around 1816 that the English type foundry of William Caslon IV released Two Lines English Egyptian. This display face contained only capitals and it is not clear from where the rather clumsy forms originated. Other sans display faces followed. Vincent Figgins was the first to use the word sans serif when he designed Two-line Great Primer Sans-serif in 1832. Two years later, William Thorowgood was the first to design a lowercase with his Seven Line Grotesque, introducing at the same time the word ‘Grotesque’. 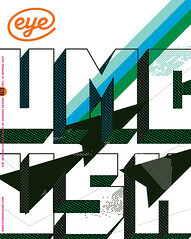 From a design point of view these typefaces have little value, but it is interesting to note their existence. In Germany at the end of the nineteenth century, the Grotesk (the German name for sans serif) gained popularity fast. These Grotesks turned out to be the most influential faces in the history of the sans serif, much more so than their English counterparts. Several German type foundries published their own Grotesks, some only in regular, some in bold or light, some only in one size, but always more or less lookalikes. They had names such as Royal Grotesk, Breite Grotesk and Lilliput-Grotesk, and the fact that most of them included a lowercase made them suitable as a text typeface, too. As type foundries merged with others or started taking over smaller ones, along with their typefaces and matrices, they tried to put all the different Grotesks together, often renaming them in an effort to create one family. But even for lookalikes the differences were huge, and it was impossible to create a coherent family of typefaces as we would know one today. In 1896 Berthold, which had become the biggest German type foundry, started releasing the Akzidenz Grotesk family, built up from existing and new Grotesks. In the years that followed Berthold managed to make a coherent family out of all the different Grotesks it had acquired, and Akzidenz Grotesk became a success. Like all sans serifs from that time, Akzidenz Grotesk was meant to be used as a display face (the German word Akzidenzschrift means display face or jobbing type), but because it also included a good lowercase and different weights it was used more and more as a text face. The different versions of the Akzidenz family were produced by anonymous punch cutters, which makes it hard to appreciate that the Grotesks were actually designed by people. One name, however, did survive: that of Ferdinand Theinhardt, who is known as the designer of Royal Grotesque and Breite Grotesque, two typefaces that later became members of the Akzidenz family. It is tempting to imagine that Theinhardt was the first in Germany to design a sans serif typeface. Whoever did, on what did he base the shapes of his new letterforms? Did these sans serif forms just cross his mind or did he have some sort of model to base them on? As there was no other sans serif design available at that time, any model would have been a serif typeface, but which? Theinhardt and all the unknown punch cutters would have been familiar with seriffed typefaces such as Walbaum and Didot. This can be seen clearly when characters of Walbaum and Akzidenz Grotesk are superimposed upon each other. The ground form or skeleton of both typefaces is almost identical. But these classicistic typefaces were far from an ideal base for a sans serif. In Walbaum, the thin tail ends in characters such as the ‘C’, and in numbers such as ‘2’ and ‘5’, were elegant, but when these thin parts were made thicker to create a sans serif form, the result was a sans serif typeface with almost 'closed' forms. And that is exactly what can be found in Akzidenz Grotesk. Where the roman of the Akzidenz Grotesk is derived from Walbaum-like typefaces, the italic is nothing more than a slanted version of the roman. Why was the italic not based upon a real italic? It is not so difficult to make an Akzidenz Grotesk italic based on Walbaum italic. Maybe with the huge competition going on among type foundries, the nineteenth-century punch cutters were under pressure to produce easy-made italics. A real italic probably was too much work or too difficult to make, while a slanted roman was relatively easy to copy from the roman. The strange thing is that this slanted roman became a sort of standard for sans italics, even today. Typefaces such as News Gothic (1908) and Helvetica all have slanted romans. Even the great type designer Adrian Frutiger made slanted romans with his sans serif designs. Only recently has he acknowledged that a real italic makes a better contrast with the roman, when his Frutiger (1977) was redrawn in 2000 with a semi-real italic instead of a slanted roman. Futura (1927) has slanted romans too, but this is more understandable since there was no real old seriffed model to base it on. As a constructed typeface, Futura borrows its forms from squares and circles, and is therefore an original design. In 1957 Max Miedinger made Helvetica. In fact it was called Neue Haas Grotesk, but for marketing reasons the name was changed to Helvetica in 1960. Miedinger based his design on other Grotesks, one of which was Haas Grotesk (1912). But Haas Grotesk had been based on Akzidenz Grotesk, so it is fair to say that Helvetica was based on Akzidenz-like typefaces. But what is ‘basing on’, when the whole Helvetica looks extremely close to Akzidenz Grotesk? At least Akzidenz Grotesk was based indirectly on a seriffed model, which makes it and its contemporaries ‘original’ typefaces. Compared to Akzidenz Grotesk, Helvetica has hardly any new features. Though claimed to be an improvement on Akzidenz Grotesk, it lacks all the character and charming clumsiness of Akzidenz Grotesk. Helvetica is blunt and colourless; the fact that its italic is slanted makes it even blunter. What a missed opportunity! Why is Helvetica so popular? This question is not so difficult to answer. First, Helvetica was aggressively marketed in the 1960s. Second, Helvetica became almost the only typeface to be used by the Swiss typographic style of that era, which continues to be very influential. The third reason is that Helvetica is neutral and colourless; it is not dangerous. This makes it easier for graphic designers to use as a display face. A typeface that already has a lot of character determines the character of a poster or a book jacket. With neutral Helvetica, the character must come from the typographic designer. This makes Helvetica beloved by many. One can make a good poster with a bad typeface, but one will not automatically make a good poster with a good typeface. As a text typeface Helvetica is an awkward creature. It is only because it is available on all computers that it is used by so many people around the world. You cannot blame them – they have no typographic education. They just have to set some text in some typeface. Unfortunately, Helvetica is about the worst choice one can make for text. Paul Rand, the American graphic designer, advised his students to use Helvetica only as a display face, and never in text, ‘because Helvetica looks like dogshit in text’. If Helvetica was regrettable, then there is a whole range of typefaces that were designed in the 1950s that deserve the same criticism. Again, as in the 1900s, all the type foundries followed one another, afraid as they were of losing market share. The result was a range of neutral typefaces such as Folio, Venus and Mercator. Univers was designed by Adrian Frutiger and released in the same year as Helvetica. Many Univers characters echo the problems that are found in Helvetica, especially in the almost closed forms and in the fact it had a sloped roman instead of an italic. But Univers was a much more original design, with one strong feature that was new in type design: it was made up of an almost scientific system of 21 weights and widths that could be mixed perfectly. It was an answer to the jungle of different sans serif faces that lacked a clear system of weights and widths. A few years ago Univers was completely redrawn, and now has more than 60 versions. Unfortunately, this has not been an improvement: there are too many superfluous weights now, the justification is too tight and the italic that was already too slanted has been slanted even more. Redesigning an old successful typeface is maybe something a type designer never should consider. In the 1980s computers started to penetrate the world. Helvetica came free with Adobe PostScript printers, but when other manufacturers cloned PostScript they could not use Helvetica. Instead, they substituted the hugely unoriginal Arial, which is very similar to Helvetica. Regrettably, Arial is now found on every computer. The popularity of Akzidenz-like typefaces has not faded, and Helvetica remains immensely popular. In 2002 Lars Müller published a little book Helvetica - Homage to a Typeface. (See review in Eye no. 47 vol. 12.) This year Helvetica, a feature-length documentary directed by Gary Hustwit, will be released [www.helveticafilm.com]. Buttons, T-shirts, weblogs, animations and games about love and hate for Helvetica are endless. Since 2000 there has again been a revival of the Akzidenz-like typefaces. The American designer Christian Schwartz based his FF Bau (2002-04) on a nineteenth-century Grotesk from Schelter & Giesecke, a former Leipzig-based foundry (Miedinger followed some of its forms for his Helvetica). Unfortunately, the italic is a slanted roman again. Akkurat (2004-05) by Swiss designer Laurenz Brunner is another Akzidenz-like design, with influences from Neuzeit Grotesk. Swiss designer François Rappo used his Theinhardt revival in the book We make fonts, a 2006 project by the University of Art and Design, Lausanne. In the future there will probably be more of these Akzidenz-like Grotesks, simply because we have been indoctrinated by Helvetica for the past 50 years. But as long as these ‘revivals’ are so similar, they don't really contribute to development in type design. The best way to design a sans serif is to base it on a serif typeface. Akzidenz Grotesk and its contemporaries were indeed based on serif typefaces, however indirectly. But Helvetica, Arial and the Akzidenz-like remakes from the 1950s and later could have been much better. Helvetica was a bad idea. We can only hope that in the still-young history of the sans serif, things will change in favour of more intelligent, more original sans serif typefaces.